Deathstroke search's for the man who abducted his friend Wintergreen. Which leads him into the attempted murder of his daughter, and a confrontation with Batman and Robin in Gotham. We begin with Superman in a meeting with Adeline Kane (Deathstroke's ex-wife). She wants Superman to take down Deathstroke. Superman not wanting any part of it, Adeline blackmails, Superman by telling him, if he doesn't bring Deathstroke in, she will send three dozen soldiers to their death as they try to attempt at bringing him in. Jericho puts on the Icon Suit and saves some kids from a burning building. He then meets up with his sister Rose (Ravager), and they discuss their father Slade/Deathstroke recent actions. Slade ends up going to his home he shared with his wife Adeline. Slade and Adeline get into a physical fight. After a few rounds at each others throats, Slade gets what he came for, some answers to some burning questions. Turns out, it was Adeline that had been pulling the strings all along, and was responsible for Wintergreen's abduction, the altercation with the Red Lion and the contract that was put out on Rose. Also she planted Richard (Luis), Roses boyfriend in her life, to get close to Rose. Later Deathstroke raids a ship, we also see him pay a visit to Luis' (posing as Richard, Rose's boyfriend) mother. She doesn't blame Slade for her stroke, but Luis does. Hosun (Slade's assistant in his current mission) gets txt message asking if he really knows who he's working for. This leaves him to abandon Deathstroke mid mission. Turns out the message was sent by Jericho's fiancé. Story - 5: At the risk of sounding like a broken record, in regards to a lot of characters I mention in these reviews, I have to say, Deathstroke is one of my absolute favorite characters in not just the DCU, but the entire comic book industry, period! This was a very hard book to write a synopsis for. I'm still a little confused on a few plot points myself still, but I'm starting to see the larger picture in the tapestry that Christopher Priest is weaving with his writing, and it gets better and clearer with each issue. To anyone that hasn't read this series and wants an overview, the best way to explain it all is, that its like the movie Inception. It may be hard to follow at first, but it no doubt oozes absolute excellence in story telling and visuals. The obvious high point this issue for me was Superman's appearance. But I especially loved the way Priest wrote him. He nailed the essence and voice of this (Rebirth) Superman. I love the refusal to do the Governments dirty work. And the call back to Aquaman #6. This is a great series so far. It has a very cinematic scope to it, while at the same time, it has that episodic feel to it also. It could work as a film or TV series, if it were to get adapted. Check it out if you already aren't. It may be that sleeper hit that you are looking for or missing. Also stay tuned for the next issue, as Superman throws down with the best mercenary that the DCU houses! Art - 5: I've only ever had a passing glance at Carlo Pagulayan's work. But I have been enjoying it very much since this series began. The opening page is a credit to how hardworking Carlo Pagulayan is. If this ere to be a Michael Bendis comic, we would have two panels, that are constantly repeated 6 times over. Pagulayan manages to add subtle little differences in Superman's face, making the story flow so much better, without it looking like a copy and paste job. When was the last time you read a comic that had 12 panels on the opening page? All else aside, this series has been well drawn by Carlo Pagulayan and a few other fill-ins. Really looking forward to the next issue. 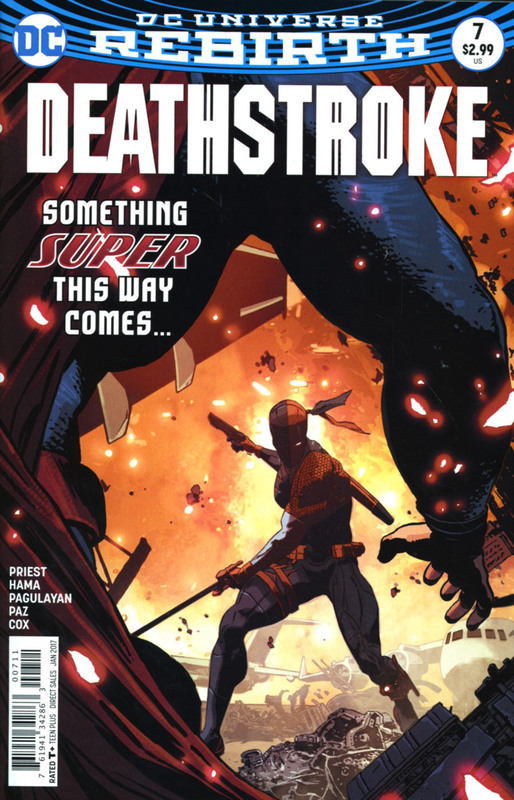 If the last page is any indication, the battle between Superman and Deathstroke should be a good one! Lastly, as all of you that read any of my reviews know, I like to mention the colorists in the art section of the book. They usually are the unsung heroes, that are constantly over looked. Jeromy Cox does a fantastic job of coloring this series. As I briefly mentioned, the last page featuring Superman is quite boss. The colors give it a greater depth. Really great job! Cover Art - 5: I like the ambiguity of the main cover. And the subtle details that remind you of the Man of Steel suit for Superman. 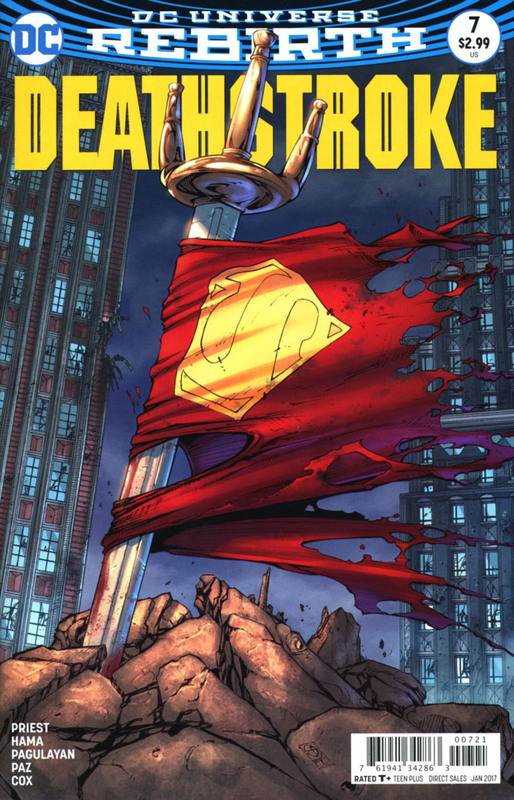 The variant by Shane Davies is a nice homage to the "Death of Superman" cover of Superman #75, Deathstroke's sword being a nice addition to the composition.